Carlos and his wife, Terry, began attending St. Thomas’ in 2011. In 2012 they moved to Maine on a permanent basis and officially became members. They are active volunteers in the parish. Prior to becoming Senior Warden, he chaired the Building and Grounds Committee and was co-chair of the most recent Discernment Committee. Carlos grew up in Cumberland, Rhode Island. Upon graduation from Boston College, he moved to New York. Carlos and Terry spent 27 years in Weston, Connecticut, raising three sons: Matt who lives in Baltimore, Maryland; Nick who lives in Bronxville, New York with his wife, Amelia; and Dan who lives in Broomfield, Colorado. Carlos is a certified financial planner and has over 38 years of banking, lending, investment, finance, and accounting experience. He is currently the Chief Risk Officer at the Finance Authority of Maine. Edmund Hartt grew up in Wilabraham, a town near Springfield, MA. His family were members of the Church of the Epiphany, where his father served as a member of the vestry and Edmund served as acolyte through his college years. He graduated from Kenyon College with a BA in drama. 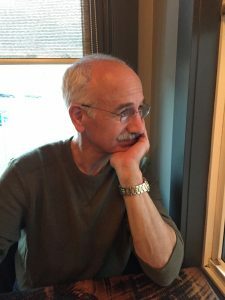 Edmund moved to Maine in 1979 to work as a camp counselor at Camp Chewonki in Wiscasset. In 1983 he moved to this area to work on wooden boats. He has lived in Lincolnville, Islesboro, Searsmont, and Camden. In 1991 he bought and rebuilt a house in Lincolnville. He makes his living as a boat builder, carpenter, and cabinet maker. He has served on the Lincolnville School Committee, the CSD Board and the Region 8 School Board. Terry was born and raised in Brooklyn, New York – the 9th of 11 children. In 1984 she and Carlos were married. Terry and Carlos spent 27 years in Weston, Connecticut, raising three sons: Matt who lives in Baltimore, Maryland; Nick who lives in Bronxville, New York with his wife, Amelia; and Dan who lives in Broomfield, Colorado. Terry and Carlos have been attending St. Thomas’ since 2011 – officially becoming members in 2012. She has been an active volunteer since 2014. Terry served on the Vestry from 2014-2017, has been Treasurer since 2015 and is a Lector at the 7:30 Service. Terry is a self-employed tax preparer and bookkeeper. She enjoys her long walks with their two dogs, Rumor and Virgie. Carlos and Terry are thankful that they found a home at St. Thomas’. Donovan has been a member at St. Thomas for the past 12 years, since retiring back to Maine, where his father’s family has been since the 1740s. Here at St. Thomas’, he has been a choir member, Eucharistic Minister/Acolyte, Worship Leader, and Eucharistic Visitor, as well as serving on the Vestry and on the recent Search Committee for the Rector. He convenes the Wednesday Bible Study group, and after taking the Education for Ministry course led by Rosalee Glass, has assisted her in EfM for the past several years. 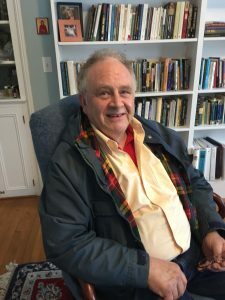 After some 22 years at the Church of the Advent, he worked with St. John’s Parish, Charlestown, Massachusetts; then joined the Parish of the Messiah in Auburndale, Massachusetts, serving there as Vestryman and Warden, coming to St. Thomas’ Church from there. He is a biologist and holds a Ph.D. in Biology from Boston University, where he taught on the faculty for the last three years of graduate school. He has been a forest ranger, a regional planner, an environmental analyst, and managed the Technical Services section of the Massachusetts Drinking Water Program, retiring to Maine in 2007. 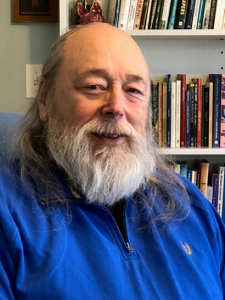 His current interests include local Maine history, and he works with several local historical societies as well as the Walsh History Center at Camden Public Library. After many years vacationing on the Midcoast, Haunani Wallace moved to Rockport permanently just over a year ago with her husband Doc, blind Greek kitty Tria Maria, and sheltie Ella. She joined St. Thomas’ in the spring after being invited by neighbors and long-time members Jan & June Dolcater. They both immediately felt they had found family, and cherish their membership in St. Thomas’. Haunani was born in Hawaii and has lived in Vancouver, B.C., Seattle, WA, Farmington, CT, Ridgefield, CT, West Wardsboro, VT, and Sarasota, FL. 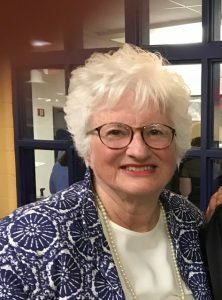 She enjoyed a 10-year career in teaching middle school math in Connecticut and New York. She and Doc have two children and 4 grandchildren. She and Doc served St. James Episcopal Church Farmington, CT as assistant treasurer and senior warden respectively. Haunani is an active member of the Rockport Garden Club and finds joy in gardening, knitting, skiing, reading, walking, sailing, and cooking. Fred might be best known for his deviled eggs. Know that he could not make those eggs without the help of Cluckette and her fellow hens. Fred and his wife Victoria live on a hobby farm with horses, sheep, chickens sometimes pigs in Appleton. Between the two of them, they have four children and nine grandchildren. Professionally he is a commercial appraiser who works primarily in Maine and Massachusetts. In public service, he serves on multiple boards including Land for Maine’s Future where he is the chairman of the Appraisal Oversight Committee. At St. Thomas he has served on both Vestry (2014 – 2016) and Building and Grounds (2015- 2018). St. Thomas is a special place to Fred; he looks forward to serving the church through good leadership, stewardship, and mission to grow membership. 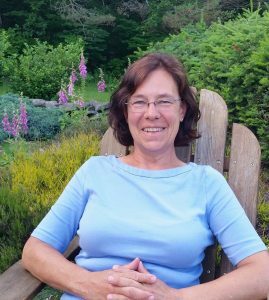 Sarah Groman has lived in Maine since she and her husband, Phil, returned to the States in December 2010, after living overseas in Asia, Africa, and South America for the previous 30 years. Sarah was born and grew up in England where she has extended family. The daughter of a doctor, she followed in her father’s footsteps but after completing her medical training, and being unsure as to which specialty she would follow, she went to work for two years for a medical charity in a remote corner of the eastern hills of Nepal. There she met her future husband Phil, who had already been working in Nepal for the previous 9 years. They were married in 1984. After further medical training for Sarah in Cardiff, Wales, they embarked overseas again, to Liberia, Kenya, Zimbabwe, Paraguay and Ecuador with Phil’s work in community development and children’s rights with Plan International. Sarah’s medical work over the years included the care of patients with tuberculosis, leprosy, and AIDS, as well as primary care in a number of settings. Sarah grew up attending an Anglican church but for many years after leaving home for medical college and working overseas did not attend church until moving to Zimbabwe. The familiarity of the order of service, the music, and the hymns, and the welcome she was given by a Bible study group were the foundation for her ‘’return to the fold” and encouraged her to join other Bible study groups and complete a one year course in spiritual formation. In Paraguay and Ecuador, Sarah served on a Pastoral Team commissioned to prepare and lead Sunday services during extended periods when there was no pastor, intermittently taught Sunday school, led women’s Bible study groups, was on the Church Board and was on the discernment committee searching for a new pastor. Moving away from clinical medical work she became involved in home visiting and pastoral care of terminally ill patients and their families, as well as bereavement work with adults and children. Sarah and her husband have been living in Union for the past 4 and a half years. They first attended St. Thomas’ during a 3-month stay in Tenants Harbor in 2011. They have 2 children, Christopher, who lives in Kennebunkport and Anna who lives in Denver, Colorado. Elizabeth Moran grew up in Camden and has been a parishioner of St. Thomas’ since 1964. She and her husband, Andrew, were summer parishioners until 1987 when they moved from Fairfax County, Virginia to Northport, Maine. In Virginia, they were married in St. Alban’s Church in Washington where Elizabeth taught church school. After moving to northern Virginia, they were members of Truro Episcopal Church in Fairfax where Elizabeth was Directress of Altar Guild and their daughters, Heather and Melissa, were acolytes. After moving to Maine, Elizabeth and Andrew and their family have been active in St. Thomas’. 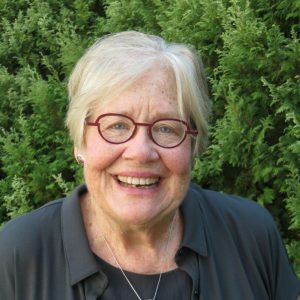 Elizabeth has served on Altar Guild, the Archives Committee, the Memorial Gifts Committee, the Building Committee for the new Church School Wing, the Finance and Endowment Committees, the Personnel Committee and the Grounds Committee. She has served as Senior Warden, Junior Warden, Treasurer and on Vestry including Clerk of the Vestry. As “unofficial” church archivist, she compiled a History of the St. Thomas Needlepoint Kneelers. Elizabeth has been active in the community as Director of the Camden Public Library for 20 years and as a volunteer on various community projects. As an Episcopalian, Elizabeth respects the rich history of the church and its Anglican heritage as the foundation for the traditional liturgy and worship of today’s church while also adapting to the changes needed in the contemporary church to keep it vibrant and growing. Lifelong Georgian until moving to Camden in July 2015. Earned Bachelor of Church Music and Master of Music degrees in organ. Served as Organist/Music Associate and Director of Music in Metro Atlanta Baptist, Methodist, and Presbyterian churches. Owned and operated Opus I Music, a classical sheet music store in Decatur and Rome, GA. Moved to Rome, GA when Leamon accepted a position as Regional Manager of the GA Department of Community Affairs. Worked as Interim Alumni Director at Shorter College before serving as a Development Officer and later as Acting VP of Development and Alumni. Worked at Berry College as a Senior Advancement Officer. Retired in December 2014. Director of 50 member community choir, Three Rivers Singers. As a member of St. Peter’s Episcopal Church in Rome, GA started children’s choir program, substitute organist, sang in the Adult Choir, served on the vestry and chaired Stewardship Campaign. Currently sings in the St. Thomas’ Adult Choir, a member of the West Bay Rotary, serves as Bay Chamber Concerts and Music School’s Board of Trustees and Co-Chair of Development Committee. Married to Leamon for 45 years. Daughter and son-in-law along with 8-year-old grandson and 4-year-old granddaughter live n Nashua, NH. Son and daughter-in-law, 5-year-old and 1-year-old granddaughter live in Portland, ME. 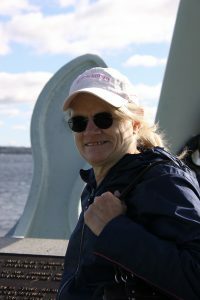 Eileen Morelli has lived in Camden, Maine for the past 4 years. She and her husband, Paul have 3 children and 7 grandchildren. Her daughter, Licia lives in Camden and her two sons, PJ and Tom live in Boston and Baltimore. Her grandchildren range in age from 7 years to 13 years old. She has also lived in Ohio, Pennsylvania, Indiana, Colorado and Birmingham, England. 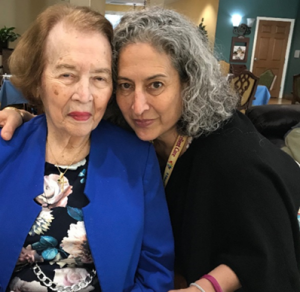 She began her career in Education as a Second Grade Teacher in Hobart, Indiana and retired as a Professor of Literature and Language Arts at Westminster College in New Wilmington, Pennsylvania. Eileen was also a Curriculum Supervisor for the Denver Public Schools and an Executive Assistant to the President of the Community College of Allegheny County in Pittsburgh, Pennsylvania. She is a certified Reading Specialist in Maine and four other states. Currently, she works with children who have reading difficulty. Eileen has always been an active member of her church and feels that this participation enhances her life’s purpose. In her service to the church, she has served as a teacher, member of the church council and chaired or co-chaired various fundraising activities. She feels it is important to continue to learn about her own spirituality, reach out to others and encourage younger people to participate in knowing God through their own religious education. 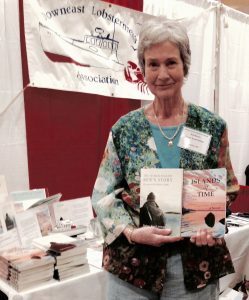 Barbara Kent Lawrence is the author of many books, including Islands of Time; The Other Island: Ben’s Story, Bitter Ice: A Memoir of Love, Food, and Obsession; and as well as books and many articles about education. She taught anthropology and history at the high school level, then co-founded and ran a real estate and construction firm in Northeast Harbor, Maine. 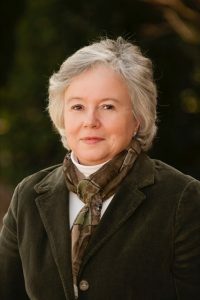 She later served as a policy analyst for the Rural School and Community Trust and then at KnowledgeWorks Foundation, while teaching writing, sociology, and education at Northeastern and Lesley universities in Boston. She has been a member of St. Thomas’ since moving back to Maine in 2015.